Jews are among the most active participants in the field of genetic genealogy. Many of the authors of scholarly articles on DNA genealogy are Jews, some of whom have also written articles about Jews and Jewish history. There are many individuals who want to know their haplotype and haplogroup and to understand where and when their ancestors became Jewish. I am a rather frequent visitor to and participant in international Jewish discussion internet sites, and I can attest that the hottest topics of discussion include who are the Jews, what is the criteria for being Jewish, and whether there are differences between Jews and non-Jews at the genetic level. Jews, I repeat, are generally very interested in Jewish genetics. I must say that Jewish discussion sites are some of the most intelligent among those I know. In general, the information level of discussions between Jews - including Russian-speaking Jews around the world – is exceptionally high, from Canada and the United States to Russia, Australia and South Africa. And, importantly, responses are mostly friendly, even when different viewpoints converge. Jews have a great interest in understanding their DNA genealogy. The fact is that the majority of them know only their recent ancestry. There are unfortunate reasons for this – in all eras, Jews have been chased by many peoples. 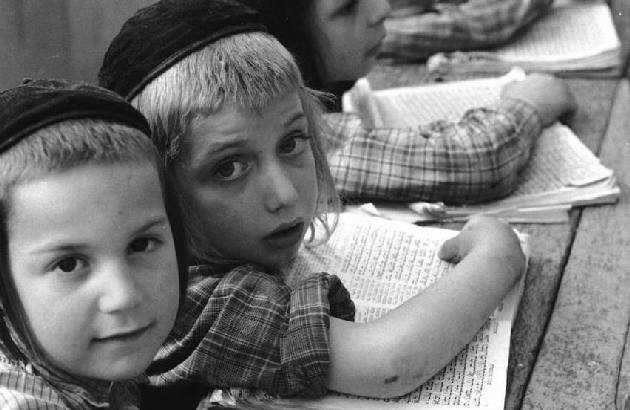 Often they were forced to flee from pogroms, persecutions, and killings, often mass killings. I was once taken aback by the fact that although the Jewish population (I am talking primarily about men, because I am mainly specializing in DNA genealogy based on the Y-chromosome, and this means men only) in Poland, Germany, Ukraine, Belarus, Lithuania, Latvia, and Russia was quite numerous at the turn of the 20th century, almost all Jews have common ancestors living mostly in the mid-14th century AD. In other words, shtetl Jews from those regions had their origins around that time. Why so? An explanation has been found. The mid-14th century (1346-1351) was the height of the Black Death plague in Europe. More than 25 million people died of the Plague. There were persistent rumors that the Plague was the handwork of the Jews, who allegedly infected water wells (though the accusers for some reason did not take into account the fact that the Jews were dying from the Plague as often as anyone else). These rumors triggered pogroms and massacres, forcing surviving Jews to flee, but to where? They had previously been driven from many European countries, leaving only one direction to escape - to Eastern Europe. The rulers of Poland, Russia, and Lithuania reacted favorably to the refugees. The Jews who arrived in those lands at that time became the forefathers of the numerous Eastern European Jewish populations of later years. DNA genealogy identifies the haplotypes of present-day Jewish men. Jewish men have many different haplogroups, among them E, G, I1, I2, J1, J2, N, R1a, R1b, and T. The common ancestors of the Jews in the Middle East had roots long before their identification with the Jewish religion, during the time of the nomads (נוודים), from whom the Jews are, in large part, descended. The common ancestors of modern Jews belonging to the ancient Middle Eastern Jewish haplogroups - E1b, J1, and J2 - lived far more than 10,000 years ago. One of the major haplogroups of the Middle East, haplogroup J, divided into haplogroups J1 and J2 some 20,000 years ago. Haplogroups R1b and R1a appeared in the Middle East much later, contributing to Jewish groups (or, rather, to the ancestors of Jewish groups) between 4,000 and 5,500 years ago. These R1b and R1a ancestors were nomads, amongst who were the wandering Sumerians (שומרים) and Akkadians (אכדים), and others who then lived in the Middle East. Approximately 4,000 years ago in Mesopotamia, there lived the common ancestor of the future Jews (and the Arabs). According to the Bible (in the portion referred to by Christians as the Old Testament and by Jews as the Torah) and the Quran, his name was Abraham (אברהם). In Mesopotamian times, people lived in numerous villages and some towns, the most significant of which were Uruk (אור כשדים) and Babylon (בבל). The earliest settlements in northern Mesopotamia date back to about 9,000 years ago; in southern Mesopotamia, the earliest settlements date back about 6,000 years ago. The first direct mention of Mesopotamia in the Bible states, in reference to the kingdom of Nimrod (נמרוד), the great-grandson of Noah (נח), that: “beginning of his kingdom was Babel, and Erech, and Accad, and Calneh in Shinar. Out of that land went forth Ashur (אשור). . . .” Those were the Assyrians. Millennia passed, and a man having haplogroup J1 (according to population geneticists who themselves have haplogroup J1; as discussed below, Jewish men having haplogroup J2 feel otherwise), a resident of the ancient city of Ur (אור כשדים), one of the oldest cities of Sumeria (שומר), came with his family from that town and wandered northwest, to the land of Canaan, on the Mediterranean east coast. His name was Abram (אברם), and he was a descendant of Ever (עבר), the great-grandson of Shem (שם), the first son of Noah (נח), as narrated in the Old Testament. With him were his father Terah (תרח), his wife Sarai (שרי), and his nephew Lot (לוט). The reasons that Abram left his hometown are unknown. The Bible says that he had a Godly revelation. But we do know that in those days, about 3,800 to 4,000 years ago, there was an economic decline in the town of Ur, leading to migration from Ur of many people who were not engaged in agricultural work and were not tied to their land holdings in Ur. The Bible provides extensive detail concerning Abram’s life. Briefly, Abram became the ancestor of the Jewish people. According to Biblical legend, God gave him the name of Abraham (“father of many nations”) instead of Abram, and gave his wife the name of Sarah instead of Sarai; according to that legend, God gave Abraham and his descendants “all the land of Canaan, for an everlasting possession.” Canaan was located, in part, in what is present-day Israel. Abraham’s genealogy, according to the Bible, is as follows: he was the son of Terah, the son of Nahor, the son of Srug. Seven generations before Srug was Shem, the son of Noah, who had, as we know, two more sons, Ham and Japheth (Ham had a son named Canaan, whose descendants, according to this legend, owned the land of Canaan). Abraham begat two sons from two wives: Ishmael (whose mother was the Egyptian maidservant Hagar) and Isaac (whose mother was Sarah). Because women cannot contribute to male haplogroups and haplotypes, Ishmael and Isaac inherited their father Abraham’s haplogroup and haplotype. Ishmael was banished from the family, married an Egyptian, and begat 12 sons named Nebaioth, Kedar, Adbeel, Mibsam, Mishma, Duma, Massa, Hadad, Tema, Jetur, Naphish, and Kedemah. “They lived from Havilah to Shur, which is east of Egypt, as thou goes toward Assyria,” the Bible tells us, and adds: “These are the sons of Ishmael . . . 12 princes according to their nations.” This became the Arab line. One of their descendants, according to the interpreters of the Quran living 30 generations later, was the Prophet Muhammad, also known as Mohammed, the founder of Islam. Abraham’s son Isaac had two sons, Esau and Jacob (Ishmael was the uncle of Esau and Jacob). Jacob fathered 12 sons, who became the founders of the 12 tribes of Israel. These sons were Reuben, Simeon, Levi, Judah, Dan, Naphtali, Gad, Asher, Issachar, Zebulun, Joseph and Benjamin. (Jacob also had a daughter, Dina, who of course did not inherit her father’s haplogroup and haplotype.) After Joseph’s death, his two sons, Ephraim and Menasheh, who were born in Egypt before the arrival of Jacob’s family, received equal rights with the rest of his 12 sons, so they too are the founders of tribes of Israel. So the total, after Joseph’s death, was 13 tribes. Later, the tribes essentially became combat units. However, Levi’s great-grandchildren, Moses and Aaron, were not included in the battle divisions. According to the Bible, they had another job, which was conferred upon them by God: it was the task to negotiate with Pharaoh to allow the Israelites to make an Exodus out of Egypt. Aaron and his descendants, members of the tribe of Levi, became the high priests. So we have the 12 tribes of Israel, plus the hereditary Levite priests, the Cohanim (or Kohanim). This is the genealogical framework as defined by the Old Testament. Because Y-chromosome markers (loci in the Y-chromosome) and alleles (the number of repeats of certain nucleotide blocks in each of the markers) are transmitted in a straight genealogical line, from father to son only, all of the brothers, as sons of the patriarch Jacob, naturally had to have the same markers and alleles as their father. (While there is a small probability that some alleles of some of the brothers mutated from father to son, such changes are relatively rare; on some markers, mutations happen on average only once in as many as 500 generations). So, if the genealogy as described in the Bible is true, all 12 tribes would have practically identical markers and alleles, and there would be only a few mutations for their direct male descendants to this day. The same would be true for Ishmael and his descendants. In other words, the present-day descendants of the 12 tribes of Israel, as well as the present day descendants of Ishmael, should have readily recognizable haplotypes as compared to other people. Because this is an important statement, let me repeat it again. If Ishmael really bore the relationship with the founders of the 12 tribes of Israel that is described in the Bible, then many present-day Arabs (who are the direct descendants of Ishmael) and many present day Jews (who are the direct descendants of the 12 tribes, including the Cohanim, who are the direct descendants of Aaron, the great-grandson of Levi), should have very similar haplotypes. Now let us explain the mutations in a little more detail. The analysis is somewhat complicated by the fact that in the past 3,600 to 4,000 years there were definitely mutations in the marker values of this “Abraham-derived” haplotype. In the short six-marker haplotypes considered by researchers a mere 10 to 15 years ago, on average there is one mutation about every 3,000 years. (This is a statistical evaluation, and no one can give a more accurate estimate.) Therefore, the six-marker haplotypes of descendants of Abraham, Isaac, and Ishmael either would not contain any mutations compared to their forefathers, or would have very few mutations, with their alleles shifted a little bit up or down, again as a matter of statistics. As a result, today we would see a cloud of various haplotypes, at least several dozen of them, which would however still be very recognizable as compared to the haplotypes of other people. The further history of the 12 tribes is described in detail in the Bible: Jacob had 12 children, and when the family settled in Egypt it consisted of 75 people, including women and children. After 210 years, Jacob’s descendants left Egypt (the Bible stated that 430 years were spent in Egypt, but this period dates back to the birth of Abraham). One may recall the Biblical story how, at the time when the Israelites left Egypt, Pharaoh pursued the refugees with his army, but the waters of the sea parted, missing the “mingled people,” and then closed again, swallowing Pharaoh and his army. Thus the Israelites finally escaped the Egyptian yoke. According to the Bible, in the second year after the Exodus, in the wilderness of Sinai, Moses and Aaron counted 603,550 men in the tribes of Israel aged 20 years or more. The Bible punctually lists the number of men for each tribe, from the smallest one, the tribe of Benjamin, with its 35,400 people, to the most numerous, the tribe of Judah, with 74,600 people. The total amount does not include the descendants of Levi. According to the Bible, God said to Moses, “for the tribe of Levi do not bring in their census and not the sum of them among the Children of Israel, but appoint the Levites over the tabernacle of testimony, and all its furniture . . . and the Levites shall keep charge of the tabernacle of revelation” (Numbers 1:49 -53). 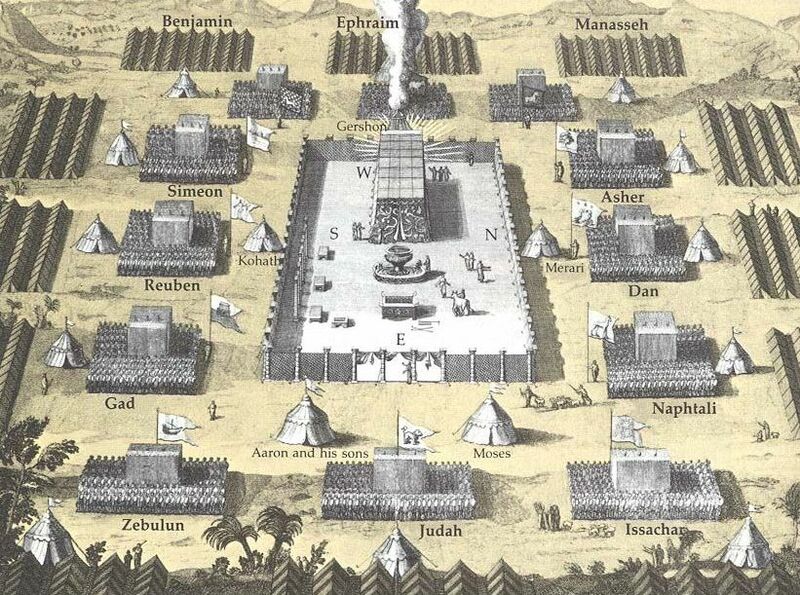 The image below shows the layout of the 12 tribes of Israel around the Tabernacle in the Sinai desert. As can be seen, the number of members of the tribes of Israel in those years grew by leaps and bounds. And the dominant haplotype of the 12 tribes was, presumably, the same haplotype of Abraham, Isaac and Jacob. It is likely that these “hundreds of thousands” of people contained the mingled foreign people and families, as stated in the Bible. This population of 600,000 people became a challenge to feed in the desert, but the Bible explains how they were fed by Manna, food that fell from heaven. Anyway, as follows in the Bible, after decades of wandering through the desert, the army of Israel arrived in the plains of Moab by the Jordan River; it was counted again, and was found to include 601,730 people. Almost all of those counted earlier had died in the desert. The biggest losses incurred were in the tribe of Simeon, which decreased almost by threefold; the largest tribe continued to be Judah. Levites, the male descendants of Levi, were now also listed, but not as warriors, as was customary; among the Levites were 23,000 men aged 20 years and older, including boys who were close to that age. Again, the smallest tribe was Simeon. Left to the Jordan River were placed - from south to northeast - the inheritance of Judah and Benjamin, with a small inheritance to the tribe of Simeon and Dan between them, then the inheritances of the tribes of Ephraim, Manasheh, and Issachar, and further to the north, those of Zebulun, Naphtali, and Asher. Across the Jordan River were located the inheritances of Reuben and Gad. 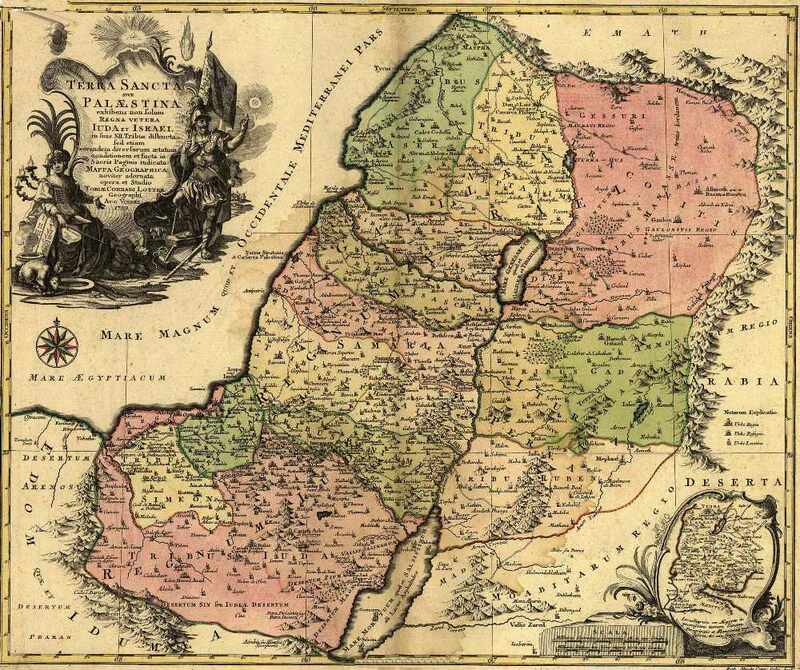 After the death of King Solomon, about 3,000 years ago, Judea split into two parts - the southern kingdom of Judah, with its capital in Jerusalem, and the northern kingdom, Israel proper. 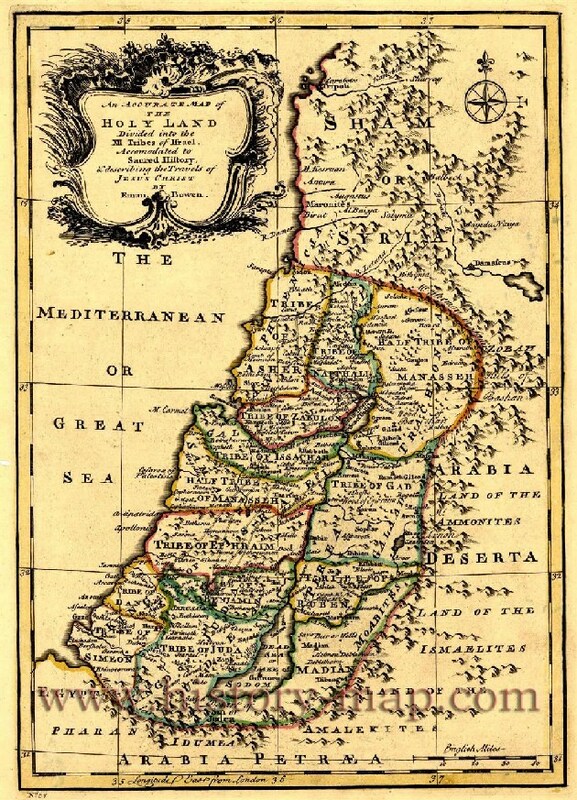 The southern kingdom was inhabited mostly by the tribes of Judah and Benjamin (whose inheritance included Jerusalem). The northern kingdom was inherited by the descendants of the other 10 tribes, largely the tribes of Joseph’s sons Ephraim and Manasheh. The tribe of Simeon lived “within the inheritance of the children of Judah” (Joshua 19:1), but for our consideration it is not so important. What is important is that the northern and southern kingdoms were at least twice subjected to havoc that led to the capture, deportation, and eventual disappearance of the 10 tribes of the northern kingdom of Israel. From 735 through 701 BC, the northern kingdom of Israel (or Samaria) was repeatedly ravaged by the Assyrians, and many of its inhabitants were deported to the inner eastern regions of the Assyrian empire. In place of those inhabitants, the devastated Jewish territory was repopulated by other tribes from Arabia and Mesopotamia, some of whom, including the Jews who were not deported, the Samaritans, have continued to live there through the present time. Such relocation of peoples was practiced by the Assyrians, and not only by them, as a remedy against possible uprisings and to increase human resources in certain areas. The southern kingdom of Judah also suffered ruin and relocation. According to the Assyrian annals, in 701 BC Assyria resettled more than 200,000 people in formerly Aramaic kingdoms. Their fate remains largely unknown. According to the annals, some of the exiles were enrolled in the Assyrian army and became Assyrian officials. Some of their descendants later returned home with the later Babylonian exiles, 200 years later. The second largest forced relocation of Jews out of Judah occurred more than 100 years after the Assyrian exile, in 598 through 582 BC. This was shortly after Judah actually became independent from Assyria. After the capture of Jerusalem, the Temple’s destruction, and the mass capture and forced deportation of people to Babylonia, the kingdom of Judah ceased to exist. However, 50 years after the fall of Babylon, the Persian King Cyrus issued a decree that allowed the exiles to return to Judah. Thousands of people returned, in what, according to Biblical sources, was an unprecedented case of the return to a homeland of people who had been captured and exiled. Among them were many who had no land ownership in Judah. Some remained in Babylon until the establishment of modern Israel. Overall, as evidenced by the sources, only two tribes continued in existence. These tribes – the tribes of Judah and Benjamin – continued to exist and to perform public worship and to teach people the laws of the Torah. The Levites, descendants of Levi, also returned to Judah, but, as described above, they did not belong to one of the 12 tribes. The remaining 10 tribes practically disappeared. Searching for them has attracted the attention of researchers, both professional and amateur, for 2,000 years. The Bible’s account that Jews and Arabs are descended from a common ancestor named Abraham must be verifiable by DNA genealogy. Several years ago, I gathered available haplotypes of Jews and Arabs belonging to haplogroup J1, put those haplotypes into a file, and ran a program to build a tree of haplotypes. The program distributes haplotypes on the basis of similarities and their most likely “flow” from one to another, based on patterns of their mutations. Thus, related haplotypes go into a separate branch on the tree, lining the order of their formation, and the program essentially reconstructs the branch as coming from one common ancestor for the branch. 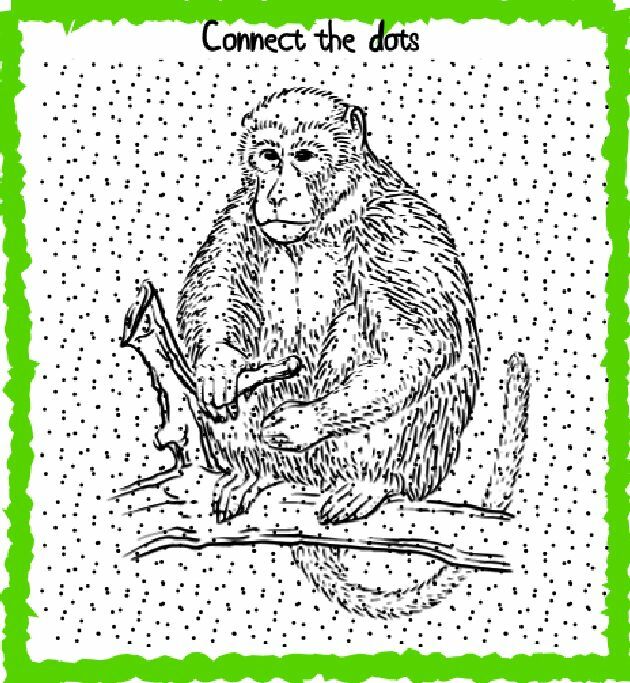 In other words, the program does the “clusterization” of haplotypes, and arranges the identified clusters, or branches, into a tree of whole haplotypes. Put yet otherwise, the program sorts the haplotypes, based on their heritage pattern. Those readers who look at a series of assorted haplotypes would immediately see - even with the naked eye - which haplotypes are related to each other, and which contain more mutations and which less. The computer program does it faster and much more reliably. I found that Jews and Arabs in haplogroup J1 formed a complex tree with many branches, most of which were young, with an age of merely several centuries. I also found that these branches were exclusively Arab or exclusively Jewish. There was no mixing between the branches in the past 2,000 to 3,000 years. This shows that the relationship between Jews and Arabs is very complicated, over centuries and millennia. Let us assume a tree with Slavic Russian, Ukrainian, and Belarusian haplotypes, or, perhaps, Irish, German, Dutch, and French haplotypes, are mixed in the same branches, and that there is no antagonism between them to impede intermarriage. Their haplotypes on a tree of the same kind would all be mixed; ethnic differences would become superfluous. This is not true as between Jews and Arabs, where cases of mixed marriages are statistically insignificant. Now we are coming to the most interesting conclusion of this part of the study: only one branch on the tree of haplotypes of Jews and Arabs of haplogroup J1, which turned out to be the oldest branch, is a double one, i.e., one half of the branch is comprised of Jews and the other half is comprised of Arabs; those branches converge at one deepest (in time) point, that is, to one common ancestor. Calculations immediately showed that the common ancestor of Jews and Arabs lived about 4,000 years ago. This is the time when the Biblical Abraham lived, although the haplotypes in the branch do not, of course, disclose his name. Thus, we have shown that Abraham belonged to haplogroup J1, correct? No, not quite; exactly the same picture appears, in principle, in the haplotype tree of haplogroup J2. Again, there are quite separate branches of Jews and Arabs on the tree, and again we see a common double branch, which converges to a common ancestor who lived the same 4,000 years ago. However, this Abraham – who else, right? – had haplogroup J2, not J1. Rather, Abraham must have had both J1 and J2, which is incomprehensible in genetics. One person cannot belong to two haplogroups (unless, of course, it is dictated by God, but science does not consider such a possibility). The age of these branches, calculated by the mutations therein, is equal to 1,300 ± 150 years and 1,075 ± 160 years, respectively. Between their ancestral haplotypes, there are 22 mutations, as noted above in bold (some mutations are counted under the special rules, such as the so-called multi- copy markers); that yields 22/0.12 = 183 → 224 conventional generations (25 years each, which is set mathematically), or about 5,600 years between their common ancestors. (Here 0.12 is the mutation rate constant for the 67-marker haplotypes, and the arrow represents the tabular correction for back mutations.) This means that the common ancestors of these branches of Jews and Arabs lived (5,600 + 1,300 + 1,075) / 2 = 3,990 years ago - again, about 4,000 years ago. It turns out that Abraham evidently had three haplotypes - one in haplogroup J1, the second in haplogroup J2, and the third in haplogroup R1a. This can be interpreted to mean that Abraham was a collective figure, although his lifetime coincides with the Biblical descriptions and interpretations of the Jewish sages. It is clear that Jews and Arabs, and their bloodlines, separated from each other in those times. The Bible tells the story of the sons of Abraham, Isaac and Ishmael; it is Isaac and Ishmael, who founded, respectively, the lines of Jews and Arabs. Thus, these calculations have confirmed that while the Bible contains mythical stories, the Bible and the Torah reflect history correctly in recounting the origin of Jews and Arabs from one ancestor (in their haplogroup), and the time period in which that ancestor lived. It also becomes clear why the search for the missing 10 tribes of Israel by DNA genealogy is difficult, if not impossible. For what and who should one look? Haplogroups? Haplotypes? We already have identified at least three haplogroups that may belong to the Y-DNA line of the Biblical Abraham, and hence the 12 tribes of Israel - J1, J2 and R1a. Let’s first consider where haplogroup R1a appeared, since it is one of the most obscured among the Jews and Arabs. Eleven years ago, data were published in the academic literature showing that about 10% of Ashkenazi Jews have the haplogroup R1a (Behar et al., 2003). But Jews belong to many different haplogroups; 10% is a relatively large percentage for one haplogroup. Moreover, it was found that Jews in haplogroup R1a are mostly Levites, the descendants of Levi, whose roots lead directly to Jacob, Isaac, and Abraham. At the end of 2013, a detailed article about the Levites (Rootsi et al., 2013) was published. That article reported that of all the different haplogroups within Ashkenazi Jews, some 15% are of haplogroup R1a (87 people out of 600 tested Ashkenazi), and that the percentage of Levites who have haplogroup R1a is as much as 65%, that is about two-thirds of all Levites are R1a. Previously, it had been speculated that Slavs injected their Slavic haplogroup R1a into the Jewish community, apparently through Levites, and that from there it was propagated to other Ashkenazi Jews. Among some geneticists, there still reigns a belief that haplogroup R1a is Slavic in origin. For example, in a 2010 article (Atzmon et al., 2010), the population geneticists write, “these impurities could occur from Ukrainians, Poles or Russians.” But the authors, discussing the haplogroup R1a in Jews, did not bother to look at the Jewish haplotypes, which differ markedly from those of the Slavic haplogroup R1a. Let’s look at this on the more precise 111-marker haplotypes. Thus, the Slavs have nothing to do with the origins of R1a Jews. R1a was brought by the Aryans. The Aryans came out of the Russian plains. One wave of them headed south through the Caucasus to Mesopotamia, where they came into close contact, literally, with the ancestors of modern Jews. Thus, haplogroup R1a entered the Jewish milieu. About 1,300 years ago, towards the end of the first millennium AD, haplogroup R1a Jews passed through a bottleneck population, that is they almost disappeared, but their DNA line revived (well, not revived literally, but the surviving R1a Jewish haplotypes started to multiply). As a result, virtually all modern Jews belonging to haplogroup R1a are descendants of a common ancestor who survived 1,300 years ago; by fate, he was a Levite. Between the haplotype of R1a Arabs and R1a Jews there are 27 mutations, which separates their common ancestors by 27/0.198 = 136 → 158 conditional generations, that is by 3,950 years. This in turn means that they descend from a common ancestor who lived (3,950 + 4,050 + 1,300) / 2 = 4,650 years ago. Once again, this is the time period of the Aryans, within the margin of error. It turns out that haplogroup R1a Jews, like other R1a peoples of the Middle East, trace their DNA genealogy to the ancient Aryans. And within this genealogy there was one common ancestor who lived 4,000 years ago ad who gave his DNA line to both Jews and Arabs, and not just to Arabs; those R1a Arabs now live mainly in Saudi Arabia, the UAE, Qatar, and Kuwait. One more interesting thing should be mentioned about the haplogroup R1a among Arabs. The Aryans who went south from the Russian plains, passed Mesopotamia, and reached the Arabian Peninsula and the Gulf of Oman (where Saudi Arabia, the UAE, Qatar, and Kuwait, mentioned above, are located) brought R1a to those people. Arabs who have done DNA testing have looked in amazement at their test results putting them in haplogroup R1a. However, what baffled them a few years ago (and brought them a great deal of embarrassment) has now became more understandable. They already recognized that their R1a haplogroup defines the boundaries of the range of the ancient Aryans and their campaigns and expeditions in Arabia about 4,000 years ago. Their haplotypes are typical Aryan haplotypes from the Russian plains, similar to the R1a haplotypes of Indian, Iranian, and Slavic descendants of the Aryans. Between them there are only seven mutations. Now it becomes clear why the political leaders of the USSR were constantly talking about the “brotherly Arab people.” This, of course is said as a joke, but it had some truth, at least by heritage. Seven mutations between the common ancestors of the Slavs and Arabs belonging to haplogroup R1a puts them at 7/0.198 = 35 → 36 conditional generations, that is only 900 years. Their common ancestor lived (900 + 4,900 + 4,050) / 2 = 4,925 years ago, and this is again within the time period of the Aryans, who appeared on the Russian plain about 4,900 years ago. All of the dating of the common ancestors of the above haplogroups – 4,500, 4,650, and 4,925 years ago - is within the margin of error of the calculations, which are approximately plus or minus 10%. Currently haplogroup R1a among Arabs reaches 9% of the male population, including such well-known clans as the Quraysh clan, from which came the Prophet Muhammad, the founder of Islam, and his clan is mentioned in the Quran. I get many letters from the noblest Arabs who have haplogroup R1a who were first shocked by their haplogroup – and attempted to hide it – but gradually that haplogroup became prestigious. There is an analogy with the higher castes in India, where haplogroup R1a reaches 72%. It seems that the story of the arrival of the Aryans, who in fact entered into a higher caste in India and are present on the Arabian Peninsula, is not yet as well known as the story of the Indian and Iranian Aryans. Now the most adventurous Arab minds raise the question whether haplogroup R1a was inherited from Muhammad himself, and from Ismail (Ishmael), the son of the Biblical Abraham, “the ancestor of the Arabs,” according to the Bible, and therefore from Abraham himself. Strictly speaking, the answer to this question is unknown thus far. But given that Abraham (or whatever the name actually was of the common ancestor between the main patrilineal lines of Jews and Arabs) lived 4,000 years ago, just at the time of the Middle East campaigns of the Aryans, such probability cannot be excluded. However, I honestly doubt this version. It would be too twisted if Abraham was a junior descendant of the Slavs, so to speak, or an illegitimate son of the military campaigns of the Aryans in Mesopotamia. Here is a word about the relationship of Biblical stories and academic science. Perhaps this may upset Jewish readers, but academic historians and archaeologists, including Israelis, usually do not mention any “tribes of Israel.” The tribes are not discussed in historical scholarship. Even a fundamentalist article in the journal Biblical Archaeology Review (How did Israel Become a People?, November-December 2009, written by Israeli historian Avraham Faust), does not mention the tribes. The earliest reference to Israel - the famous stele of the Egyptian pharaoh Merneptah, the son of Ramses II, which is also called the Israel Stele, with a caption inscription from 3,300 years ago - says, “Israel is in the dust, his seed is none.” The word “Israel” is accompanied by a hieroglyphic, pointing not to the country, but to people with this name. As we know, the inscription ultimately turned out to be incorrect. In the period from 3,550 to 3,200 years ago, Canaan was completely ruled by the Egyptian pharaohs. Those were the times in which the Bible depicts the Exodus from Egypt, the finish of wandering in the wilderness, and the settlement of the Israelites in Canaan, in the sections of territory of the tribes of Israel discussed above. Again, historical science does not know of territories, or tribes. Immediately after this period (3,200 years ago), Israel entered the Iron Age, which lasted for 200 years. It was a time of multiplying small Israeli settlements, of which there were hundreds in these two centuries. Among them, it is worth noting Mt. Eibal, Shechem, Shiloh, Izbet Sartah (Ebenezer), Bethel, Khirbet Raddana, Ai, Mizpah, Jerusalem, and Giloh (from north to south) (per the article of Faust, 2009). These names are dear to the heart of Israel, and some exist in our time. In the 10th century BC, Israel appears as a monarchy. In general, and in particular, as discussed in the article cited above by Faust describing in detail the archeology of the time, there are no signs of the tribes of Israel or the separation among them, either in the archeology or in science in general. Moreover, the article notes that to the dismay of many professional archaeologists, there is a gap between the descriptions of these lands and territories in the Bible and what has been found, or rather not found. According to many researchers, there is no indication that the ancient inhabitants of these settlements once saw themselves as Israelites (a number of scholars seriously doubt the Israelite identity of those settlers). Many are inclined to believe that academia should more correctly called those settlers “Canaanites,” specifically in the time before the period of the monarchy, or Iron Age II (1,000-586 years BC). But that is a contradiction. You can see that the Bible, in principle, correctly describes the genealogy of Jews and Arabs, pointing to the correct dating of those events with reasonable certainty. The Bible gives the date of the Exodus from Egypt; there was at that time a large eruption of Santorini (about 3,630 years ago), which is reflected in the Bible when describing the Exodus, but archaeologists do not (yet) see this. Perhaps this is an area where DNA genealogy could help. In principle, there could be a clue, the Kohanim DNA genealogy. Kohanim are “by definition” descendants in the male line of the high priest Aaron, the brother of the Biblical Moses who led the Jews out of Egypt about 3,600 years ago. I repeat that Biblical sources are not academic history. But nevertheless, the priests are in the Bible, and their principal historic mission was to serve as the main Temple priests. Thus, the haplogroup of Kohanim would be the haplogroup of Aaron. Other options cannot be verified so fundamentally. But there is a problem, or rather a series of problems. Let’s start with the fact that when tests of the Kohanim, or rather, the people who declared themselves to be Kohanim (and this was the criterion for identifying the Kohanim in studies conducted by population geneticists) show that they have a whole bunch of haplogroups and subclades (21 subclades from different haplogroups). So many haplogroups cannot be Kohanim. 80% of the priests belong to five different haplogroups (Hammer et al., 2009). Less than half of the Kohanim (46%) belong to haplogroup J1, subclades J1a2b-P58. So many of the Kohanim titles was “assigned,” which should not be surprising. Everyone has probably seen the surnames Kogan, Kagan and the like; their roots are from the words “Cohen” or “Cohan,” which are synonyms. Many Cohen-related names are translated from the Hebrew as “a true Cohen,” which already shows that some of claimed Kohanim were not real. This is not surprising; people are weak. Remember the forgery of documents by the Russian nobility, and, in fact, by any other nobility. Given that the first paper on Kohanim was published in the 1990s (Skorecki et al., 1997) by a group of Jewish authors who have haplogroup J1, the researchers began to aggressively pursue the idea that Kohanim belonged to haplogroup J1, and that Aaron belonged to haplogroup J1, and, accordingly, that Abraham and all 12 tribes of Israel were also of haplogroup J1, and hence that J1 was the most, so to speak, kosher haplogroup. Overall, there was some reason for this hypothesis because J1 is one of the main haplogroups of Jews. But this reasoning is partial; haplogroup J2 is also one of the major haplogroups of the Jews, and many of the priests were in haplogroup J2, as were members of Cohen-related associations around the world, including in Russia, Central Europe, and Latin America. By analogy, as members of haplogroup J2 were at the level of bishops, they were naturally offended, and science showed that J2 have no less, and, perhaps, a greater, claim to being descendants of Aaron. A more detailed inspection of haplotypes found that the common ancestor of the Kohanim haplogroup J2 (and those most senior Kohanim) lived about 3,500 years ago, but the common ancestor of the Kohanim haplogroup J1 lived only 1,050 years ago. This writer took part in these studies, published scientific works on the Cohen issue, and even received an award for “significant contribution to the study of the history of the Jewish people,” inscribed on the medal and diploma awarded. It is because the priests inherited their haplogroup J1 from a recent common ancestor (living 1,050 years ago) that most of the group had nearly the same mutations, thus giving a rise to the premise of the “Kohanim modal haplotype.” The same population geneticists (mostly Jews) did not have enough knowledge to realize that if the haplotypes were almost identical, they must be very young, not some 3,500 years old. The first articles on DNA genealogy about Kohanim in the late 1990s through the early 2000s (Skorecki et al., 1997; Thomas et al., 1998; and Behar et al., 2003) were simply ignorant and false, though some of that can be attributed to the limited development of genetic science at the time. The problem is that these illiterate and false conclusions are today repeated abundantly. Chief among these ignorant and false conclusions is that the Kohanim share a common haplotype and that supposedly there is a certain characteristic Kohanim “signature” (i.e., a specific set of matching figures), and that for this set of figures it can be calculated that the common ancestor of the Kohanim lived about 3,200 years ago and that Kohanim belong to haplogroup J1 for the “reasons” explained above. But this is all wrong. First, the same set of marker numbers are also carried by many Arabs, who are not Kohanim. The common ancestor of the Arabs with the same “Kohanim signature” lived about 9,000 years ago. Clearly, then, the alleles of those distant Arab haplotypes were more mutated, and the “Kohanim signature” was diluted. But if you consider a recent Kohanim ancestor living about 1,050 years ago, the “signature” is than preserved to a greater proportion. Thus, the “signature” did not identify priests, especially since many Kohanim belong to other haplogroups. That caused Jewish population geneticists (and other population geneticists) to estimate wrongly that the common ancestor of the Kohanim haplogroup J1 lived 3,200 years ago. It was simply wrong to mix the different haplotype branches of Jews - among them a young branch (1,000 years to the common ancestor) and an ancient branch (8,000 years to the common ancestor, at that time the Mesopotamian nomads) - and averaging those results, a usual “methodology” employed by population geneticists. Thereafter, this data were cleaned up a little bit, but a new trick was employed – the use of the infamous “population constant,” which overstates dating by three times on average; that yielded 3,200 years to a “common ancestor of Cohanim of haplogroup J1,” inflated about three times as compared to the more correct calculated value of about 1,000 years ago to the common ancestor of the Kohanim haplogroup J1. Thus, to summarize with regard to the Kohanim, the perceptions of the DNA of Kohanim, the idea of the “modal haplotype Kohanim,” and the dating of the time to the common ancestor of Kohanim is a tangle of misunderstandings, distortions and errors, resulting from a weak knowledge of how to work with haplotypes. This is the result of population genetics, not DNA genealogy. More than half of the Jews belong to haplogroups with roots in the Middle East. This refutes the lie that Jewish heritage is supposedly long degraded and that Jews lack a genetic relationship with the Middle East. Summing up this part of the essay, I note that the Jews are scattered in almost all known haplogroups, but that the ancient ancestors of the Jews are closer to the Middle East. The most ancient roots of the Jews, in haplogroups J1 and J2, go back 15,000 to 18,000 years ago; at that time, the Jews, as a religion, did not exist, but their ancestors did. In principle, the ancient Jewish haplogroups in the Middle East, haplogroups E1b, G1, and G2, go back 8,000 to 10,000 years ago. Haplogroups R1a and R1b were obtained by (future) Jews in the Middle East about 4,000 and 6,000 years ago, respectively. The remaining haplogroups of Jews were acquired later, many in Europe during the time of the Diaspora. These are primarily haplogroups I1, I2, Q, R2, X, and T and subclades. European haplogroups of Jews often date back to about 650 years ago or even later; possible reasons for this are given above. In recent studies, population geneticists are actively switching to the genomic analysis of Jewish populations. This creates a lot of problems, not with data, but with their interpretation. To summarize briefly: the data that they obtain by analysis performed on SNP DNA mutations (SNP stands for Single Nucleotide Polymorphism, an irreversible mutation in DNA alleles, of which there are millions in the genome) often depend on which fragment of the genome they chose to consider. There has been a newly published paper about the analysis of Y-chromosome that studied a fragment of 8.97 million base pairs (Rootsi et al., 2013) out of 58 million base pairs in the whole chromosome. Another study considered a piece of the Y-chromosome comprised of a half million nucleotides, and a third one considered 30 million nucleotides. In general, there is nothing wrong with such studies, particularly if the authors honestly compare data obtained between those (and other) different fragments studied by other authors. Unfortunately, most authors of genome studies typically do not bother with such “details” as examining and cross-verifying their data compared with others’ data. One merely needs to ask the right question: what exactly are those population geneticists attempting to prove? Haplotypes are generally based upon short Y-chromosome fragments that are scattered throughout the chromosome; however, they provide extremely valuable information. The techniques used to analyze genomes are amazing and have reached a high level. But the problem lies elsewhere: the interpretation of the data obtained. Here, unfortunately, population genetics often fails. Data is compared wrongly and often create a wrong picture. Many correlations of SNPs are misleading because one can combine data as one likes, and typically there is no independent cross-check. Here is one of very many examples. Population geneticists find the same pattern of SNPs in Native Americans and in the Irish, claim that there is “admixture,” and calculate that there are “12.6% of Native Americans in the Irish”. Go figure. However, this is an example of a “2D”comparison, while it should be a “3D” comparison. Most of the Native Americans (Y-chromosomal haplogroup Q) and the Irish (Y chromosomal haplogroup R) have a common ancestor of haplogroup P (from which Q and R descended); hence, they are relatives. However, they are relatives in the sense of nephews, not in the sense of “admixtures.” Nephews do not descend from each other; they are descended from a common ancestor. However, population geneticists look at similar SNPs and declare that they descend one from another. That is a typical situation when data are right but an interpretation is wrong. Therefore, when reading articles written by population geneticists, an amusing picture emerges. When data are new, a pattern is unexpected, or the answer is unclear, then an interpretation of the data is either uncertain or flatly wrong. When data are expected or are generally known, that is another matter; in that case, interpretation of the genome data is great, it is quite certain, and it leaves no doubt. Some examples are given below. So, when population geneticists work with the genomes of Jews – again, that is another matter; there, all the answers are known in advance, or so the geneticists think. Or so they wish, for various reasons. Therefore, the main task is to confirm what is known and what is written in the textbooks. 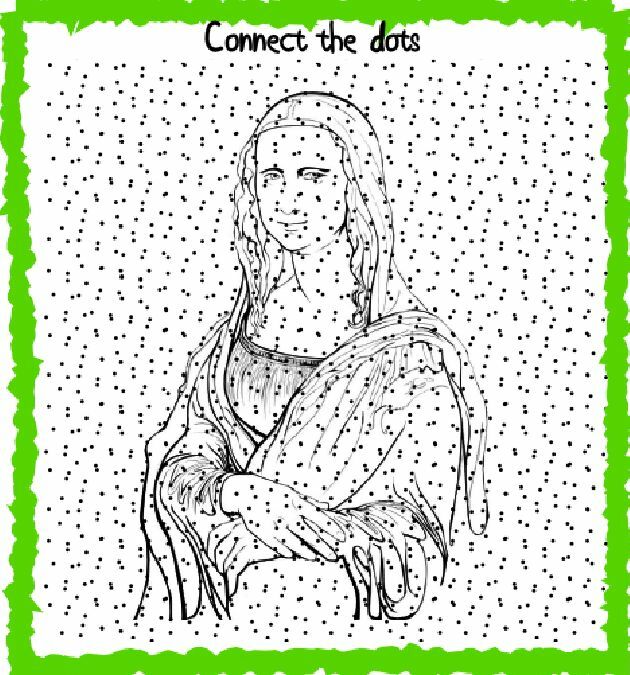 And this is very easy to do when there are hundreds of thousands of points; it is always possible to connect them linearly. Let us predict how population geneticists may study the genome of the Jews. First, they will find - without any doubt - that the Jews came from the Middle East. This, of course, is correct. Who could find otherwise? Second, they will show that all of the Jews in the world are close to each other, i.e., they form a single meta-population. Imagine if they had found to the contrary, i.e., that the Jews are not part of the same meta-population; would it not be clear that something is wrong with their methodology? But we already “know” that the Jews are essentially a single population - and the Jews are pretty sympathetic to our endeavor, so why spoil things by surprising them? Third, they will confirm some commonly known and important date to show that their work is correct. Not an unknown date, mind you. Such a discovery would be very risky. It is necessary for them to identify a well known date. When working with the Neanderthal genome, there is the issue of the date of separation of Neanderthal from Homo sapiens, which is hard to pinpoint. Indeed, there has been a great deal of uncertainty in the estimations, which include 370,000 to 660,000 years ago (Noonan et al., 2006 ; Green et al., 2008), 660,000 ± 140,000 years ago (Green et al., 2008), or 516,000 ± 50,000 years ago, and the coordinated response is still not certain. But no one throws a stone at those authors because it is a given that it is a difficult issue to date a genome. But when working with dating the Jewish genome, all of a sudden such dating becomes a simple affair. Why? Because the dates are already known. Fourth, of course, they will find that the Jews of haplogroup R1a are descended from the Slavs. Because this is “the known concept,” and there is no need to analyze it. It is very simple. Here let us see what they actually found. Let’s analyze the 2010 article “Abraham’s children in the genome era: major Jewish Diaspora populations comprise distinct genetic clusters with shared Middle Eastern ancestry” (Atzmon et al., 2010). Indeed, the first prediction came true, as is shown even in the title that the article carries. On the first day that this article was published, there were 113 posts about it in one of the most popular semi-scientific forums. And as the authors themselves definitely predicted, the press sang their praises every day for at least two weeks, emphasizing the fact that the authors had “brilliantly proved” Jews’ Middle Eastern origins. Who could doubt it? However, the picture became somewhat marred; the data from two companies (both 23andMe and FTDNA vigorously disagree with the study; 23andMe is insistent in disagreeing, whereas FTDNA applies the more modest term “speculative relatives,” as reported on a popular forum (Genealogy-DNA-L Archives, June 6, 2010, ref. 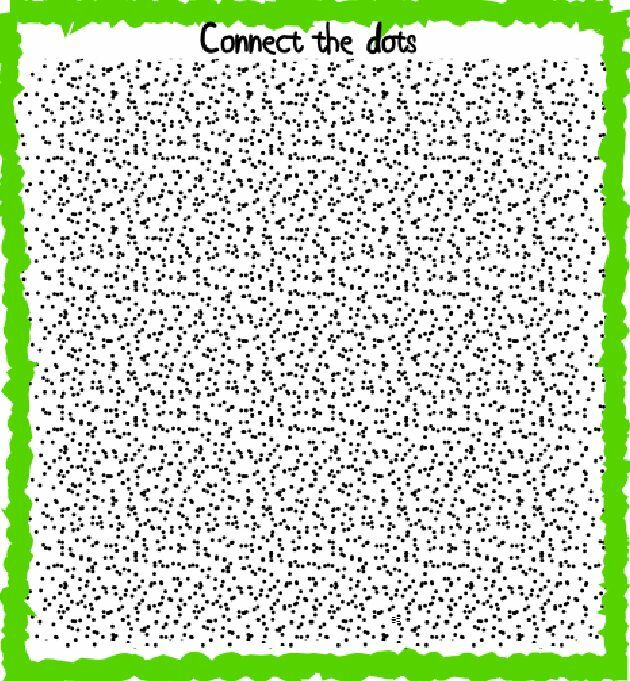 1275838688). It is possible that such sharp criticism from leading companies stemmed from the fact that the authors of the article were not chiefs of the “population geneticists” who are abundantly represented in the follow-up article - Behar, Skorecki, Semino, Parfitt, Hammer, Rootsi, Khusnutdinova, Villems. . . . But let us return to the first paper. We know that in this phase of academic science the most important thing is the writers’ roster. So, what was in the first paper? The authors chose as the material for their study 237 representatives (of whom 51.1% were women) of seven groups of Jews: from Iran, Iraq, Syria, Turkey, Italy, Greece, and a generalized European category (with an emphasis on Eastern Europe), i.e. Ashkenazim. In other words, the Jews were chosen according to a territorial principle, based on the assumption that they now live in the same areas where their ancestors lived in ancient times (2,500 to 1,500 years ago), or perhaps in the Middle Ages, and they were treated as belonging to separate categories of Jews in this research. Naturally, all of these categories must somehow overlap, but the question was where the population moved and to what extent all of the groups did originate in the Middle East. The next question was whether these groups are descended from a common ancestor in the historical period of time (i.e., within a few thousand years ago), or whether their common ancestors are all different and that some perhaps had non-Jewish origins? If so, then to what extent? Some hotheads call this “racism,” but that is certainly not the case. It is not racism to want to know and understand one’s history, the history of one’s ancestors. To answer these questions, the authors analyzed genomes of the representatives of those different populations. The representatives were selected from the HGDP (Human Genome Diversity Panel). The authors analyzed SNPs - the extent to which these SNPs overlap between Jewish family populations, on the one hand, and between Jewish and non-Jewish populations, on the other. Recall that SNPs are virtually irreversible mutations in the DNA (in this case, in all 46 chromosomes), which are practically irreversible as inherited. That was the authors’ basic methodology. This, by itself, is fine. Data are data. The HGDP initially included (at the start of the study) the genomes of 1,043 people from 52 populations around the world. Of these, the authors excluded 28 people who, according to the authors, were extreme outliers. They assigned 1,015 people to other groups, such as “Pakistanis” (which somehow included, for example, the Uighurs), “South Americans,” “Central/South Africans,” and “East Asians,” and from each group they randomly chose 25 people. Finally, they obtained 418 genomes of 16 populations, among them Bedouin, Druze, Palestinians, Circassians, Russians, Basque, French, northern Italians, Sardinians, African Mozabites, Africans from central and southern Africa, East Asians, South Americans, and Pakistanis (Hazara, Kalash, and “other”). The subjects did not include Scandinavians (among them Finns), Ukrainians, Germans, English, Irish, Scots, Poles, and other Eastern Europeans, residents of the Baltic states, and so on. This immediately sparked a wave of criticism because Poland, Germany, Ukraine, Belarus, Latvia, and Lithuania are the basin of the origin of, and then the rebirth of, Ashkenazi Jews, yet for some reason those regions were excluded for purposes of this important study. As a result of this selection of the subjects, the authors picked 164,894 SNPs. And what did subsequent analysis show? Or perhaps the mountain, so to speak, gave birth to a mouse? Yes and no. The article reached a conclusion based on the analysis of genome-wide Jewish groups: “Genome-wide analysis of seven Jewish groups (Iranian, Iraqi, Syrian, Italian, Turkish, Greek, and Ashkenazi) and comparison with non-Jewish groups demonstrated distinctive Jewish population clusters, each with shared Middle Eastern ancestry, proximity to contemporary Middle Eastern populations, and variable degrees of European and North African admixture,” as rendered in the abstract to the 2010 article. But who could doubt this, especially when it is written in such a vague wording? After all, such a conclusion is quite obvious from haplotypes of the Y-chromosome, the presence of North African haplotypes of haplogroup E1b1, and the presence of clusters of haplotypes for haplogroups, and their presence in Middle Eastern common ancestors, and proximity to contemporary Middle Eastern haplotypes, sometimes in one branch on the haplotypes tree. In this sense, there is no news or surprises from such genomic analysis. After all, we are not going to take seriously claims from Palestinian and other “historians” that modern Jews have no origin in the Middle East; it is their “historians’” political creed, and we understand why they take this position. Apparently, the article by Atzmon et al. is intended largely as a countermeasure to these political “historians,” and this is a reason that the authors were praised by the media. My comment: The existence of Middle Eastern Jews and Ashkenazi Jews has long been known, although the parallel treatment of Ashkenazi Jews (“European” or “German” Jews) with Syrian Jews is something new (to me, anyway). My comment: This provision requires clarification in the article as to who are considered the Slavs. If ancestors who lived 4,900 years are considered, then there was a Slavic contribution; if ancestors within the last 2,000 years are considered, then there was no Slavic contribution. The same is true with regard to the Central and Eastern Europeans. R1a1 among Ashkenazi Jews is somewhere there. And it appeared that they had an ancestor who lived 1,300 ± 150 years ago (Rozhanskii and Klyosov 2009; Rozhanskii and Klyosov, 2012), as described above. However, the article contradicts itself, and then the authors do not exclude the possibility that there could be a contribution from the Slavs. My comment: Is there anyone who is surprised by this? Did they not expect it? This has long been known, and especially in recent years it has been made apparent by systematic analyses of haplogroups in DNA genealogy. So, what is the bottom line of their conclusions? Very little. Generally, nothing is new. Rather, it is of interest for genomic research technology, rather than to learn anything new about the Jews. According to the article by Atzmon et al., all Jewish genomic clusters are represented in one generalized population to which the closest of all are Palestinians, Bedouins, and Druze, while Bedouins are the most different among all. Jews are noticeably different from Europeans, Asians, Africans, and Central South Africans. The authors have tried to calculate the time difference of the Jews to “Middle East” and “European” components. The task was made easier by the fact that the answer was basically a foregone conclusion. This dates back to the Assyrian (735-701 BC) and Babylonian (598-582 BC) conquests, when the northern Israel kingdom (or Samaria) was destroyed, and after the capture of Jerusalem, the time of the destruction of the Temple, mass conquest and forced deportation of the Jews to Babylonia, and Judah ceased to exist. That is, it was 2,745 to 2,600 years ago (see above). Could the authors have reached some other conclusion? Naturally, they reached the same conclusion after making a number of assumptions in their calculations. First, the population of the (future) Jews living 5,000 years ago was postulated as 1,000. Why? Just so. The authors stated this number is “small and realistic.” Where is this “realism” found? The authors do not explain. And what would the results be if calculations were based upon 500 people, or 2,000? Would the result be any different? The authors again did not explain. Population genetics is the same. Further, the Ashkenazim were excluded from this calculation. Why? This could change the results. The authors may have initially included the Ashkenazim, but then chose not to show results. In any event, they provide no explanations. As a result of these assumptions, the authors’ answer was that “Middle Eastern” and “European” Jews split 100 to 150 generations ago. That is indeed when the Jews were expelled to different populations and lands. But what “generation count” is to be used in connection with historical dating? If the authors would have taken the normally accepted view in population genetics of 25 years per generation, that would equal 2,500 to 3,750 years ago; that would have resulted in a moderately bad fit with actual history (2,745 to 2,600 years ago). If the authors assumed a generation of 30 years for the population, which is often mistaken to be a more accurate assessment, the calculation would be 3,000 to 4,500 years ago - again, not a very good fit. The authors chose to take 20 years per generation for the population, and they, of course, got a good fit – 2,000 to 3,000 years, exactly as in the title of their article. Why they chose 20 years is not explained. What is amusing is that the press delightedly wrote that the Jewish genome exactly predicted the time to the captivity of Jews in Babylonia and Assyria. Yeah, right, as the Americans say. That is the way that history is made. It becomes clearer why 23andMe and FTDNA rejected the study as “speculative.” In fact, it is not so – the research has some usefulness. The authors were working hard to satisfy “public expectations,” and the public in any event does not go into the details; here, the authors brought and gave the public what the public wanted. The authors would have liked to find admixtures of other haplogroups among European Jews, and, in particular, they would have liked to mention in that respect the Khazars and Slavs. But since the answer is not known beforehand as for the proximity of Ashkenazi to Khazars or of Ashkenazi to Slavs, the authors do not dare to give an answer, but they make a nod in that direction. They write, “Admixture with local populations, including Khazars and Slavs, may have occurred subsequently during the 1000 year (2nd millennium) history of the European Jews.” And then, “Notably, up to 50% of Ashkenazi Jewish Y chromosomal haplogroups (E3b, G, J1, and Q) are of Middle Eastern origin, whereas the other prevalent haplogroups (J2, R1a1, and R1b) may be representative of the early European admixture.” Obviously, as soon as the authors depart from facts and proceed to speculation, they start making one mistake after another. For example, haplogroup R1b Jews are not “European.” They were initially from the Middle East, arriving there from Anatolia and the Caucasus, and the “age” of the R1b Jews was about 5,500 years, 1,500 years earlier than the time of arrival of R1b in Europe. In fact, these admixtures are not from Russians, Ukrainians or Poles. Regarding Khazars, since nothing is known about their haplogroups, anything can be suggested without taking any responsibility. As shown above in this paper, where haplogroup R1a arose among the Jews, it came from the Aryans. The authors of the paper (Atzmon et al.) were not aware of this fact. That is why the authors’ “interpretations” were all over the place. As we see, genome data are not very helpful when the answer is not known beforehand. The authors finish the article with the rather obvious statement, “Over the past 3000 years, both the flow of genes and the flow of religious and cultural ideas have contributed to Jewishness.” Who would argue with that? Almost simultaneously with the publication of the article by Atzmon et al. (12 authors), there was the publication of an article by Behar et al. (21 authors). What did the Behar et al. article show as compared with the Atzmon article? The methodology employed was the same in principle, except the second paper analyzed not 164,894 SNPs (as in the Atzmon paper) but 362,566 SNPs. Again, from the very beginning of the Behar et al. paper, the authors proclaim what has, in principle, long has been known, namely, “Historical evidence suggests common origins (of the Jews) in the Middle East.” On this basis, the authors set out to trace genomic commonality of Jews from 14 communities in the Diaspora and 69 non-Jewish populations, mostly European, Middle Eastern, and African. Among their findings, the authors showed, for example, that Ethiopian Jews and Indian Jews have nothing “Jewish” in their origin, and are indistinguishable from the populations of Ethiopia and India, respectively. I reached the same conclusion seven years ago in a series of popular articles, “Joseph and His Brothers,” based on the analysis of mere six-marker haplotypes of Jews in Ethiopia and India. Therefore, the large-scale genome studies with hundreds of thousands of SNPs have just confirmed the conclusion of DNA genealogy obtained with small haplotypes. Indeed, if, for example, Jewish Ethiopians have the same haplotypes as other Ethiopians, how could genome research change this conclusion? If the haplotypes of a majority of Jews indicate their Middle Eastern origin, how could the study of the genome of the Jews change this fundamental conclusion? Naturally, the study of the genome provides a lot more information, but DNA genealogy gives quite adequate conclusions. Actually, the three conclusions set forth above comprise the abstract of the paper (Behar et al, 2010) about the origins of the Middle East Jews, how many populations were studied, and the fact that the Ethiopian and Indian Jews are Jews by faith and not by genetics. Accordingly, the authors believe that these findings are the most important in their work (hence, they comprise the abstract). In any case, the most important conclusion from both articles (Behar et al., 2010) and (Atzmon et al., 2010) studies, which the authors did not make, and which is hard to overestimate, is that Y-chromosome haplogroups are in general markers of current genome populations. The genome reflects the Y-chromosome haplogroup, having it as a label. Based upon the usual “logic,” it would seem that nothing should remain in the genome of an ancient Y-chromosome haplogroup, and women do not have a Y-chromosome, so that there can be no correlation with ancient genome chromosome haplogroup based on a tiny chromosome that is one of 46. However, in reality such a correlation exists, and it is a strong one. Naturally, this is only the beginning of such studies. But the findings are encouraging, and further emphasize the importance of Y-chromosome haplotypes and haplogroups for DNA genealogy and population analysis. The latest article on the study of the genome of the Jews came in late 2013. It was dedicated to the Levites of haplogroup R1a, and, to a small extent, the Jews of haplogroup R1b (Rootsi et al., 2013). Because the authors could not handle an adequate analysis of haplotypes, since they are not DNA genealogists but population geneticists, they did not analyze haplotypes in their paper, as was done above in this study (using the 111-marker haplotypes of Levites, Slavs and Arabs in haplogroup R1a. In their article, there was only a list of 19-marker haplotypes; however, they were analyzed incorrectly, again using the infamous “population rate constant mutation,” which commonly overestimates dating by two to four times. Indeed, that was the result that the authors obtained. But since the authors did use that dating for historical considerations, it is not clear why they attempted to obtain that dating in the first place. Population geneticists usually substitute the process of dating with the word “diversity,” thus eliminating quantitative considerations. It is true that they measure “diversity” quantitatively, but not used in any meaningful way. So in the cited article (Rootsi et al., 2013), the authors reported that compared with the Jewish haplogroup R1a, the same haplogroup for gentiles in the Middle East show “a higher diversity.” Because the authors do not explain their finding on “higher diversity,” they apparently have no idea that the R1a Jews went through a severe bottleneck of the population about 1,300 years ago, and that the non-Jewish populations in the Middle East did not suffer from any bottleneck and thus share an original common ancestor dating back 4,050 years, resulting in what the authors call “high diversity.” Instead, the authors write that the Jewish haplogroup R1a shows the “founder effect,” another fuzzy population geneticists’ term that explains nothing, and only presents an observation. The authors wrote that “in contrast to previous assumptions of Eastern European origin of Ashkenazi Levites” (i.e., that the R1a Levite haplogroup supposedly descended from the Slavs, as the lead author of this article had previously assumed), they now suggest that the R1a Levite haplogroup originated in the Middle East. The authors did not suggest where haplogroup R1a suddenly appeared in the Middle East; apparently, it came from thin air. The technical part of the article is good and advanced. The authors decoded genomic Y-chromosome fragments of 8.97 million base pairs (out of 58 million base pairs), for eight Jewish R1a and R1b haplogroups (R1a - Ashkenazi-Levite and non-Ashkenazi-Levite; R1b - from Turkey, Morocco, Kurdistan, Iraq, Mumbai (India), and Ashkenazi) and five non-Jewish haplogroups (R1a - from Ukraine, Iran, the Pyrenees, and Assyria; R1b - Christian Arab), and showed that the carriers of haplogroup R1a-M198 diverge into six branches. In other words, almost everyone was in a separate branch of the genome, most of which correspond to the individual subclades. Thus, in haplogroup R1a, there were: Ukrainian subclade S198/Z282; Iranian, in subclade Z93; two Gujarati Hindu haplogroups, in subclade L657; Assyrian, in subclade Z2122; Jews from Iraq and Mumbai (India) in subclade Z2123; Ashkenazi-Levite, non-Ashkenazi-Levite, and an Iberian (from the Pyrenees), in subclade M582. Practically all Levites in haplogroup R1a (65% of all Levites) belong to subclade R1a-Z93-L342.2-Z2124-Z2122-M582, or, in a short-hand notation, R1a-M582. This was indeed new information in the cited paper. Also, the authors have properly dated a common ancestor of two Ashkenazi in subclade R1a-M582 employing SNP mutations. In a Y-chromosome fragment of a size of 8.97 million base pairs, they have counted 21 SNP mutations between them, which gave 21/8.97*106/1*10-9/2 = 1,170 years to a common ancestor, and rounded it up to 1,200 ± 300 years. This fits with a value of 1,300 ± 150 years (Klyosov and Rozhanskii, 2009, 2012) to a common ancestor of Jews in haplogroup R1a. This was probably the very first case when population geneticists properly calculated a time span to a common ancestor using mutation rate constants, in this case those for SNP mutations. Unfortunately, population geneticists are in disagreement regarding which mutation rate constants to employ, and they continue to come up with new values of those, without critical consideration of known values. This is typical for population geneticists. Click here to read the comments on Professor Klyosov's article, as translated by Google Translate. Click here to read the second page of comments on Professor Klyosov's article, as translated by Google Translate. © 2014 by Anatole A. Klyosov. This article was originally posted on January 30, 2014, in Russian, titled Поговорим о ДНК-генеалогии евреев. The article was translated from Russian into English using Google Translate. The translation was polished by Bennett Weinstock, Jeffrey D. Wexler, and Meir G. Gover. The English version of the article was edited by Professor Klyosov before he permitted Meir G. Gover to post it. The comments to the article have been translated using Google Translate, but have not been polished. The article and the comments thereto were posted on LeviteDNA.org after Professor Klyosov granted permission to Meir G. Gover to do so. Professor Klyosov has provided this website with an open letter addressing the issue whether autosomal DNA evidences Khazarian ancestry for the Ashkenazi population.